A B M P m e m b e r s e a r n F R E E C E a t w w w. a b m p . c o m / c e b y r e a d i n g M a s s a g e & B o d y w o r k m a g a z i n e 21 NEWS NOTES compiled by Brandon Twyford Editor, Online and Digital Strategy | brandon@abmp.com Pain Experts Say a Change in Habits Can Beat Opioids for Chronic Pain Roughly one-third of Americans live with chronic pain, and the large number of opioids doctors prescribe to treat that pain is a significant factor behind the country's growing opioid epidemic. However, recent research shows opioids are no better for the treatment of chronic back pain and arthritis than nonopioid medications. 1 In fact, according to Erin Krebs, MD, a primary care physician and researcher at the Minneapolis VA Health Care System, "Drugs of any kind are the lesser choice for the vast majority of patients." In an article published on April 6, 2018, National Public Radio (NPR) writes, "There's a growing consensus among pain specialists that a low-tech approach focused on lifestyle changes can be more effective." In addition, Krebs says, "The gold standard for treatment is a combination of things like exercise, rehabilitation therapies, yoga, and cognitive behavioral therapies." Her approach is in line with recent guidelines from the US Centers for Disease Control and Prevention, which state, "Nonpharmacologic therapy and nonopioid pharmacologic therapy are preferred for chronic pain. Clinicians should consider opioid therapy only if expected benefits for both pain and function are anticipated to outweigh risks to the patient. If opioids are used, they should be combined with nonpharmacologic therapy and nonopioid pharmacologic therapy, as appropriate." Read the full story from NPR at https://n.pr/2JdS0u3. Note 1. E. E. Krebs et al., "Effect of Opioid vs Nonopioid Medications on Pain-Related Function in Patients With Chronic Back Pain or Hip or Knee Osteoarthritis Pain," JAMA 319, no. 9 (2018): 872–82. Fifth International Fascia Research Congress Since its debut more than a decade ago, the International Fascia Research Congress (FRC) has established itself as a cutting- edge event where basic science researchers and a wide variety of clinical health professionals come from across the globe to connect and come to a clearer understanding of the role of fascia in the body. The 2018 FRC "Connecting Key Issues: How Fascia Research can Impact Healthcare Outcomes" will be held in Berlin, Germany, November 14–15. The first FRC was held in 2007 at Harvard Medical School in Boston and past-president of the Massage Therapy Foundation Diana Thompson was there. As a massage therapist, author, educator, and research consultant Thompson has twice served on the congress planning committee and was a post- conference presenter for the third FRC. She's keen to attend the 2018 congress. "I love to understand the whys and hows of massage," Thompson says. "Research helps me connect the dots, which informs my treatment planning, and helps me explain things to clients so they can make better informed choices about self-care and lifestyle changes. We are the only ones who can inform research so that it answers our questions and is applicable in our practices. The conversation is essential." Subsequent congresses were held in Amsterdam (2009), Vancouver (2012), and Washington, DC (2015). Each forum has been known for enhancing researchers' understanding of bodywork, as well as helping practitioners better understand the science behind each of their sessions. 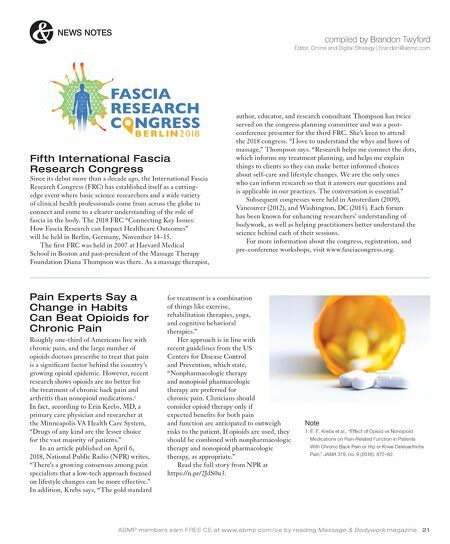 For more information about the congress, registration, and pre-conference workshops, visit www.fasciacongress.org.